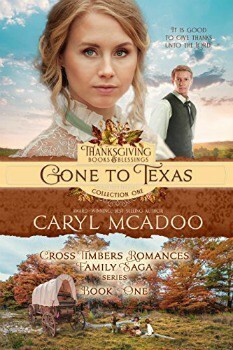 Right now, you can download Gone to Texas (Thanksgiving Books & Blessings Collection One 1) Kindle book written by Caryl McAdoo for FREE from Amazon. In Book One of the Thanksgiving Books & Blessings Collection and the all new Cross Timbers Family Saga series, Gone to Texas uncovers a deception that drives seventeen souls to hard choices. Either stay on the land they thought they’d bought or heed the lure of free land in the faraway wilderness of a new Republic. Rife with peril and hardship, three families knit together by blood and friendship head out with a widowed man, daughter, and his slave, gambling everything they own on the prospect of land ownership and working it together. Does friendship pave a way to marriage? Can puppy-love survive through a harrowing journey to blossom into a forever love? With duress at every turn, can the clan stay together all the way to Texas and accomplish their goals?